Astronomers have discovered a special kind of neutron star for the first time outside of the Milky Way galaxy, using data from NASA's Chandra X-ray Observatory and the European Southern Observatory's Very Large Telescope (VLT) in Chile. Neutron stars are the ultra dense cores of massive stars that collapse and undergo a supernova explosion. This newly identified neutron star is a rare variety that has both a low magnetic field and no stellar companion. 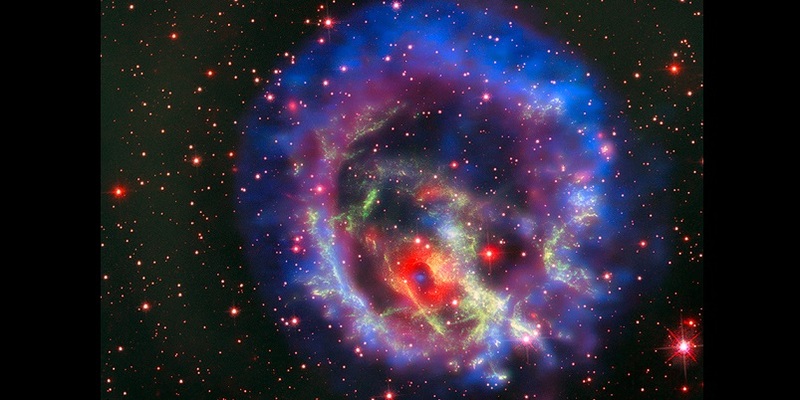 The neutron star is located within the remains of a supernova — known as 1E 0102.2-7219 (E0102 for short) — in the Small Magellanic Cloud, located 200,000 light years from Earth. This new composite image of E0102 allows astronomers to learn new details about this object that was discovered more than three decades ago. In this image, X-rays from Chandra are blue and purple, and visible light data from VLT's Multi Unit Spectroscopic Explorer (MUSE) instrument are bright red. Additional data from the Hubble Space Telescope are dark red and green. Oxygen-rich supernova remnants like E0102 are important for understanding how massive stars fuse lighter elements into heavier ones before they explode. Seen up to a few thousand years after the original explosion, oxygen-rich remnants contain the debris ejected from the dead star's interior. This debris (visible as a green filamentary structure in the combined image) is observed today hurtling through space after being expelled at millions of miles per hour. Chandra observations of E0102 show that the supernova remnant is dominated by a large ring-shaped structure in X-rays, associated with the blast wave of the supernova. The new MUSE data revealed a smaller ring of gas (in bright red) that is expanding more slowly than the blast wave. At the center of this ring is a blue point-like source of X-rays. Together, the small ring and point source act like a celestial bull's eye. The combined Chandra and MUSE data suggest that this source is an isolated neutron star, created in the supernova explosion about two millennia ago. The X-ray energy signature, or "spectrum," of this source is very similar to that of the neutron stars located at the center of two other famous oxygen-rich supernova remnants: Cassiopeia A (Cas A) and Puppis A. These two neutron stars also do not have companion stars. The lack of evidence for extended radio emission or pulsed X-ray radiation, typically associated with rapidly rotating highly-magnetized neutron stars, indicates that the astronomers have detected the X-radiation from the hot surface of an isolated neutron star with low magnetic fields. About ten such objects have been detected in the Milky Way galaxy, but this is the first one detected outside our galaxy. But how did this neutron star end up in its current position, seemingly offset from the center of the circular shell of X-ray emission produced by the blast wave of the supernova? One possibility is that the supernova explosion did occur near the middle of the remnant, but the neutron star was kicked away from the site in an asymmetric explosion, at a high speed of about two million miles per hour. However, in this scenario, it is difficult to explain why the neutron star is, today, so neatly encircled by the recently discovered ring of gas seen at optical wavelengths. Another possible explanation is that the neutron star is moving slowly and its current position is roughly where the supernova explosion happened. In this case, the material in the optical ring may have been ejected either during the supernova explosion, or by the doomed progenitor star up to a few thousand years before. A challenge for this second scenario is that the explosion site would be located well away from the center of the remnant as determined by the extended X-ray emission. This would imply a special set of circumstances for the surroundings of E0102: for example, a cavity carved by winds from the progenitor star before the supernova explosion, and variations in the density of the interstellar gas and dust surrounding the remnant. Future observations of E0102 at X-ray, optical, and radio wavelengths should help astronomers solve this exciting new puzzle posed by the lonely neutron star. A paper describing these results was published in the April issue of Nature Astronomy, and is available online. NASA's Marshall Space Flight Center in Huntsville, Alabama, manages the Chandra program for NASA's Science Mission Directorate in Washington. The Smithsonian Astrophysical Observatory in Cambridge, Massachusetts, controls Chandra's science and flight operations.